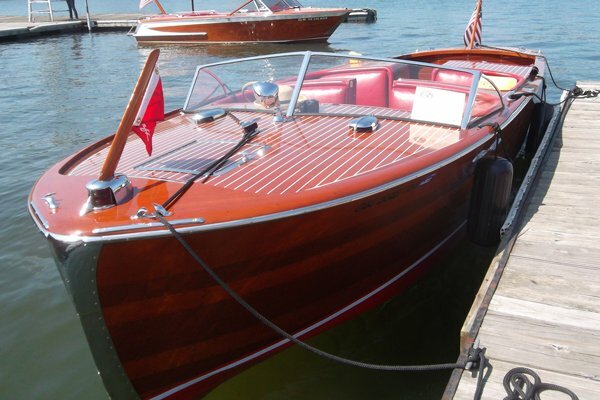 1946 Chris Craft 25′ Sportsman. Many years ago my wife, Cindy, and I saw one of this model at a show somewhere and we both fell in love with the size and comfort level of this boat. We finally made the decision to find one and I located this boat in Michigan. The wood looked rough but all the hardware was included. With the help of a friend,I drove up to get it with an empty trailer and loaded it up. We had to stop after a few hours of driving because what hardware that was on the boat was starting to come loose from the dry wood and rough road. We pulled everything off and continued home. The boat received a new bottom, sides and deck. There was no engine included with the boat as the original was a Scripps 208 and it had been removed years before to power someone else’s classic but I found a used Crusader 454 at the local marina at that became the new power. It has been a smooth, reliable powerhouse that can push the boat over 40 MPH even with several passengers. The Andrew J was found in a barn in Oklahoma and towed home in an ice storm early in 2012. 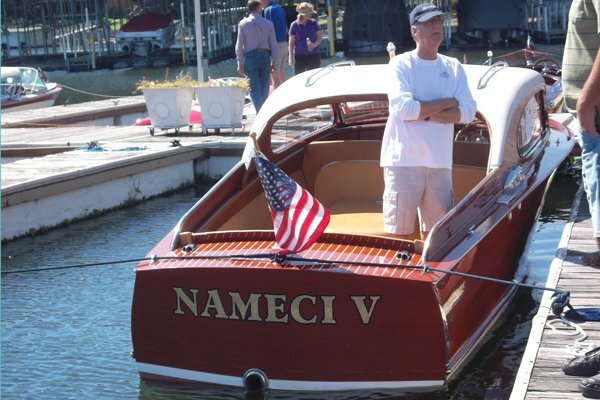 The boat was restored and brought back to life by Dan Nelson of Nelson Boatworks in Minnetrista, MN. Her hull is painted Okoume plywood. The Andrew J is the only 1948 26’ Deluxe Sedan Cruiser known to exist. She is appropriately named after the founder of Higgins Industries, Andrew Jackson Higgins. Andrew’s daughter, Dawn Higgins Murphy, still resides with her husband Bob near New Orleans and has sanctioned the name. 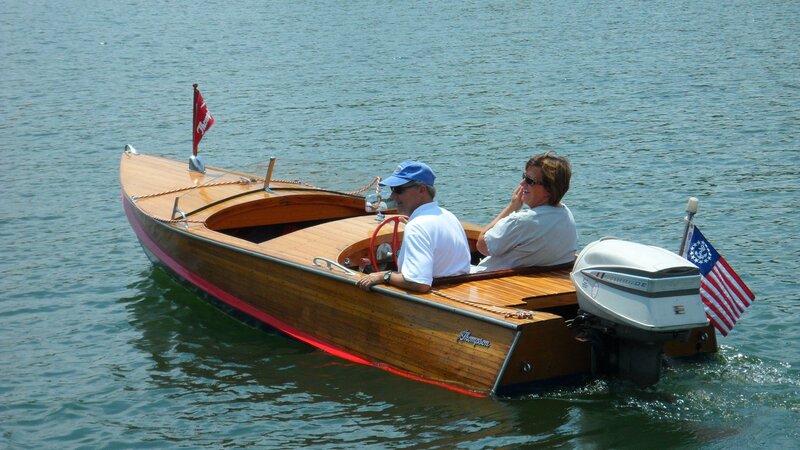 She is powered by the original 115 HP Chrysler Crown engine and runs eloquently through the water with the same hull configuration as the swift PT Boats of WWII, built by Higgins Industries. 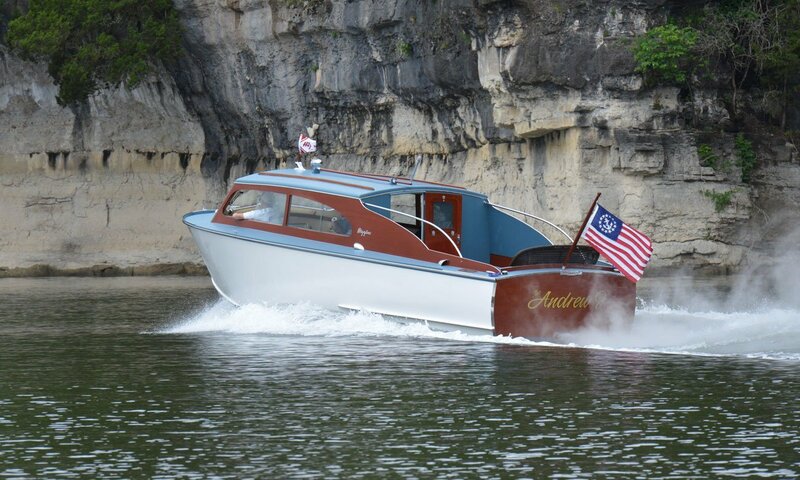 In the past few years, she has won many awards including the prestigious Best of Cruiser Class-Preserved at the 2012 ACBS International Boat Show held at Table Rock Lake near Branson, Missouri. “Nameci” is named after Eric’s father who was the Ice Man. 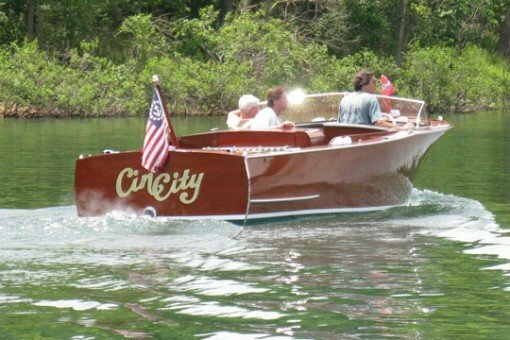 Purchased from Colin Jensen of Souix City, IA in 2003 Original dealer was at Minnetonka Lake in Waputa, MN Original owner were Bud & Opal Phillips who bought it from dealer above and made Lake Okoboji, IA it’s first home. Original boat name was OPAL after the first owner’s wife’s name. 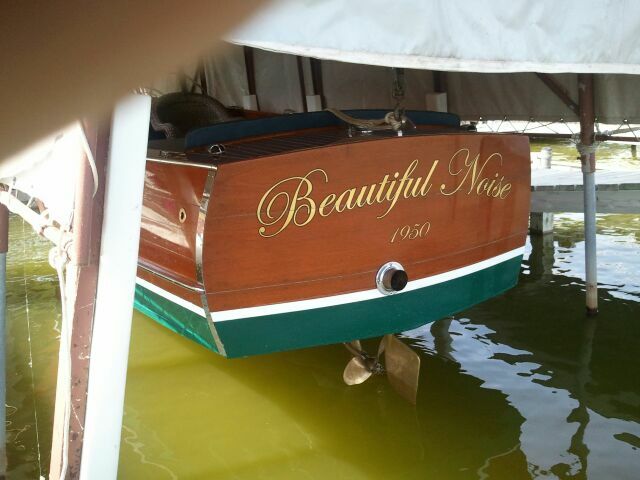 I did a complete restoration in winter of 2012-2013 and renamed her BEAUTIFUL NOISE after the popular Neil Diamond song. Current home: Capitol Beach Lake, Lincoln, NE. Mischief is a 1950 22 foot Chris Craft Sportsman (Hull number U-22-1530). 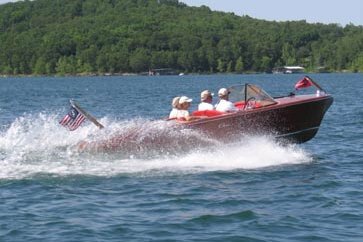 She was delivered to Milam Brothers Marine Service, a Chris Craft dealer on Lake Hamilton at Hot Springs, Arkansas, on March 14, 1950. We purchased Mischief in August of 2012 from Jan and Larry Hinton after their 14 years of stewardship, becoming at least her fourth caretakers. Mischief was reintroduced to the water on September 10, 1994. It was originally powered by a 130 hp Chris-Craft motor, but now is powered by its second motor, a 1956 Chris-Craft MBL 158 HP motor. Among the improvements made by the Hinton’s were the “new” motor, a middle bench patterned off the 22’ Chris Craft Sedan model, and returning the floor and dash to original. Home port now for Mischief is on Table Rock Lake, Missouri. Name: Rescue Thom (The boat was used for a period as a search and rescue boat on the Great Miami River in Ohio as late as the mid-1960’s, hence the name). It was bought by John & Carolynn Thompson from a couple who used it on Burntside Lake in far northern Minnesota. In 2018, Rescue Thom was sold to Russel West. 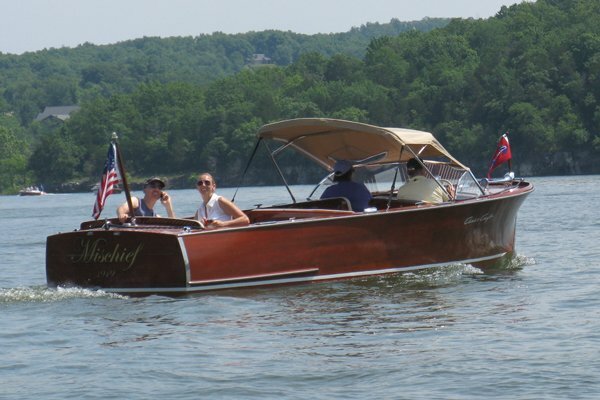 Kathleen is a 1954 Chris Craft 20’ Special Sportsman we acquired in August, 2010. The boat was ordered for delivery to Wyandotte, Michigan and built on June 11, 1954, Hull # SS-20-162. The order specified it be built as a Special Sportsman with cockpit coverings and linoleum floor covering. However, what makes this boat somewhat unique is that it was ordered with a semi-enclosed hardtop with side curtains. While there may have been a few other 20’ Sportsmen ordered with the hardtop option, this is the only one we have seen. 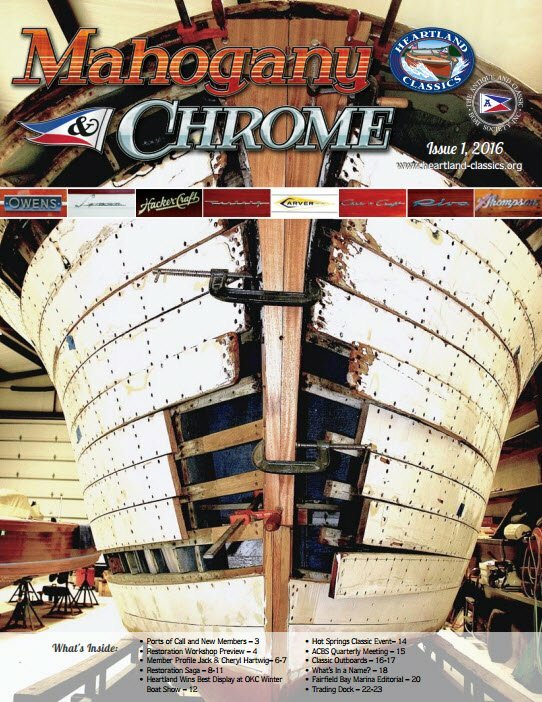 She underwent a complete restoration in early 2000 and had been in the water only 3 times after her multi-year restoration which included a West System bottom, engine overhaul, new upholstery, and refinish. All wood is original. Since our acquisition we have converted her 130 hp M engine to 12 volts, added new floor covering, new aluminum fuel tank, new prop and strut and an additional gauge panel that includes fuel gauge, switches for front and rear bilge pumps, fume detector, 12 volt outlet, and she now sits on a new trailer. 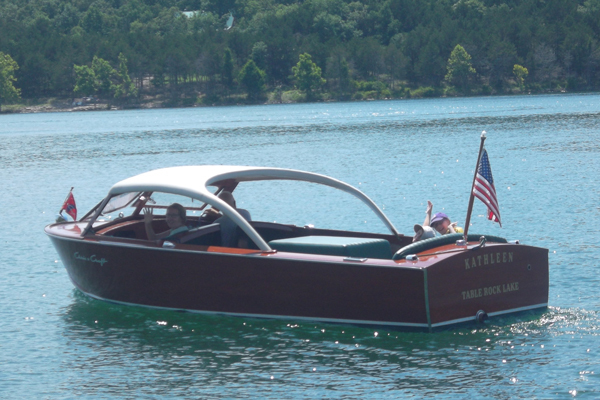 Kathleen is a proud member of the Heartland Classics fleet and calls Table Rock Lake her home port.